The movie is set in North Africa September 1942. Germany’s top General Erwin Rommel’s and his dreaded Afrika Korps are poised to invade Egypt. The allied command sends in a British Special Forces unit that includes German Jews which invariable causes friction and distrust with their British commandos. They proceed to kidnap a Canadian officer held prisoner by the Vichy French government in Algeria who is an expert topographer. The officer, Donald Craig, is charged with the daunting challenge of guiding this company of British and German-Jewish commandos through 800 miles of the desolate Sahara. The goal is to aid a planned amphibious landing against the seaport of Tobruk and its massive fuel storage base. The team is forced to confront and overcome various challenges, the final one being the discovery of an undetected German armored force poised to launch into Egypt. Bronislau Kaper’s career was on the wane when in 1967 he took up this scoring assignment for Arthur Hiller. Not much music was recorded as the score comes in at just over 35 minutes. We can thank Intrada for resurrecting the score from the hallowed vaults of Universal Studio. The score is newly mixed and mastered in full stereo from the actual multi-track session masters. My compliments to Intrada for a most welcome release. The main title and prologue opens dramatically with the score’s potent and dominating eight-note main theme that has a distinctly Rozsa-esque quality to it. It is an energetic march carried by blaring fanfare, snare drums with interestingly enough flowing harp accents. The cue ends with the theme slowly fading away like the warmth of day in a desert sunset. This eight note theme dominates the entire score and appears throughout the much film in many different permutations, indeed it is the prime thread that holds the tapestry that is Kaper’s score together. Much of the score’s expression is devoted to evoking tension and suspense given that the film involves a secret mission. These cues include “Frognapped”, “Mine Field”, “Traitor of the Tunnel”, and “Exit Portman”. In each of these Kaper employs subtlety, dissonance and at times minimalism to expert effect which are quite effective in keeping the audience unsettled. In tension filled second cue “Frognapped” where the Canadian officer is kidnapped, woodwinds and muted horns open the cue and serve to effectively create palpable tension. A restrained restatement of the main theme sounds as the team secures the Canadian’s freedom. The cue concludes with an abrupt and dissonant expression of the main theme. 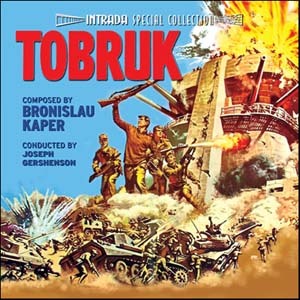 With “Traitor of the Tunnel” Kaper employs bassoon, violins, flute and bass interplay with solo oboe to create significant unease. A restrained, fragmentary and variant statement of the main theme by oboe and strings brings the cue to a truncated end. In the brief “Mine Field” we are treated to a very effective minimalist cue where Kaper cleverly mixes xylophone and bass create an eerie sense of tension and trepidation. The main theme is heard once again, although in understated and in fragmentary form. “Exit Portman” is a most interesting and complex cue. Opening with subtle string and woodwind textures it shifts and becomes quite eerie and unsettling as trilling piano and violins elicit a sense of danger. The main theme echoes in the lower brass registers in fragmentary statements and for a time a determined drum march arises, yet it is short-lived as once again Kaper suppresses it with dissonant brass and woodwinds. In “Desert Convoy/Prepare for Attack” Kaper evokes the plight and struggle of the desert. One feels a sense of dread and danger that seems to me portentous. Quivering strings, harp and piano play as a muted and somewhat somber variant of the main theme is presented. At the 1:40 mark where the music segues into the second scene, the cue picks up pace and vital energy. Yet this is short-lived as the pace again slows and dissipates giving way to a sense of dread provided by a solo oboe supported by strings, drum and piano. “Harker’s Humor” is a brief cue where again we hear the main theme presented with a richer fanfare in a slowed and determined presentation. At the 0:45 mark the theme’s expression becomes dissonant, carried by frenetic string writing which eerie and evokes tension. In “Taureg Trade/Caravan Continues” a sense of urgency is felt as the cue opens with violins and drums, but we are lulled as it slowly segues into some gentle ethnic Arabic thematic coloring. But the mood is quickly lost as strings and brass shatter the tranquility and restore the tension, ending with yet again the main theme. “Head hunters” is a dissonant and percussive cue. A fatigued and struggling restatement of the main theme opens the cue. Brass and percussion attempt to instill vital energy and yet one is left with a sense of futility as brass and strings stagger forward. “The Big Dump opens with a powerful bravado statement of the main theme as the team closes in on their goal. But the march is short-lived and wanes, unable to sustain its vital energy as the team contemplates the sobering realization of the impending challenge. In “Shalom” dissonant brass start the cue off with vigor and seem to restore a sense of vitality, yet again its energy dissipates. After an brief interlude of solo cello the main theme returns in accelerated force for a brief concluding statement. For Bergman’s Death” a dissonant variant of the main theme marches forth with great energy that again quickly subsides. After a interlude of distant drum the theme is reborn anew and yet again concludes without ever achieving the grand climax. The final cue “End Title/End Cast/Emblem” is not a unified cue, but is instead comprised of three separate standalone statements. In the first, a bravado and triumphant acclamation of the main theme concludes the film. In the second statement, “End Cast”, we are find a bravado restatement of the main theme march that concludes with a brass flourish. Finally in the “Emblem”, the third component of this cue we are treated to a Main Theme coda. Lastly, it is my general practice to not invest time reviewing what I call score fragments; here defined as cues about one minute or less in length. It is my experience that the music cannot sufficiently develop and articulate a melody or theme to make a cogent statement or lasting impression. I acknowledge that there will be occasional exceptions, and if so, I will include them. As such, after listening to the full score, I have decided to bypass and not comment on the following six fragmentary cues; “Rendezvous”, “Sitting Duck”, “Night Camp”, “Many Tanks” and “The Guns of Mersa”. I commend Intrada on their reclamation efforts and while the sound is not pristine 24 bit quality, it is never the less well done and does not detract in any way to the listening experience. Kaper presents essentially a single theme score carried by an energetic and dramatic march first heard in the main title. The theme had great promise and does appear throughout the score in many interesting and different permutations, however, Kaper never really expands upon or fully explores the theme. We are never provided sustained development or the grand dramatic climax we desire for such militaristic themes. As such, I was left wanting and disappointed. I am however impressed by how Kaper evoked tension, danger and unease with his music. The score is a somewhat of a departure for Kaper in so much that he extensively provides dissonance in his writing. This tactic worked very effectively both in the film and on the CD as a stand alone listening experience. Music composed by Bronislau Kaper. Conducted by Joseph Gershenson. Orchestrations by David Tomkin and Leonid Raab. Album produced by Douglass Fake. “Enjoyed the review. Must admit the comment about not having “pristine 24-bit quality” is slightly weird. What recording from 1967 does?? Hi Doug, the point is well taken. I was trying to provide context. I appreciate that you took time to read the review. I am extremely happy to have found this site, however, I’d like to see the original release dates for the scores (if known). Just a suggestion. Again, thrilled to have found this little well of musical knowledge. Thank you, Craig!